The driveway above is constructed entirely of reclaimed materials. 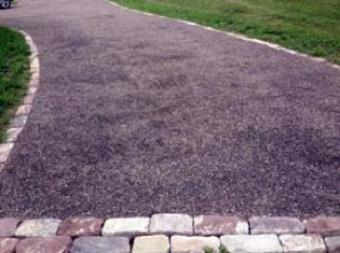 Sandstone cobbles were used to edge the sustainable driveway, asphalt millings were used as the base materials and crushed reclaimed stone as the top coat. To find out more about the reclaimed materials we offer, visit www.exbricks.com or call 716-691-3061. Copyright © 2013 Experienced Bricks, All rights reserved. You are receiving this email because you expressed an interest in receiving information from Experienced Bricks. Thank you!